Set up in 2006 to help revive the historic lavender industry in the area, which boomed during the eighteenth and nineteenth centuries, Mayfield Lavender is a 25-acre organic lavender field on an original Victorian site situated on the North Surrey Downs. Two varieties of English lavender are grown on the chalky soil; flowers are harvested and distilled to produce lavender oil. Visitors are welcome to wander the field and enjoy its scent. There's also an alfresco teashop. Those arriving by public transport are advised to take the 166 bus from Epsom. 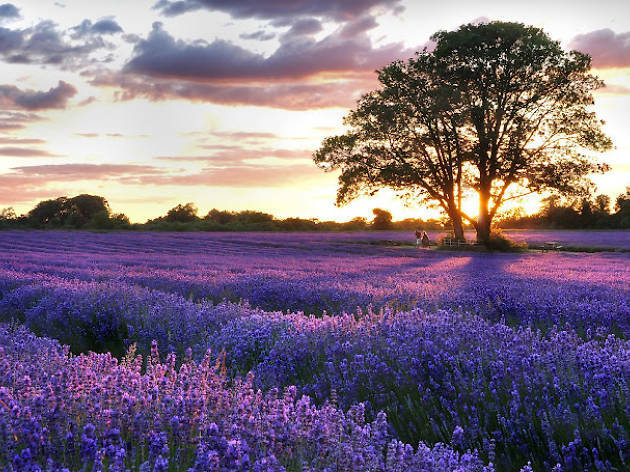 Mayfield Lavender is a stunning 25-acre lavender farm, less than 15 miles from central London. Open from June 1 to September 30, guests are free to roam amongst the lavender and enjoy a cup of lavender tea in our al fresco restaurant. Entry costs just £1 and goes towards the upkeep of the farm. Lovely spot just outside London to while away a few hours. I was disappointed as we went on the 1st weekend of June when it opened and there was a slight purple tinge in the field but nothing like the pictures below, I think i'd have to wait until June/July for that. The cafe was cool and sold all things Lavender related, we had lavender still lemonade which was punchy and delicious. I'll have to return when it's a bit warmer. No need to go very far. Simply head to Mayfield Lavender Farm few km outside London for an afternoon surrounded by beautiful lavender fields. It's one of my Summer discoveries. Despite living in South West London for years, I've never heard about this place before. The fields are absolutely stunning and really unexpected to find in London suburb. For 1£ only you can wander the field, lay down between the aisles and enjoy the lovely lavender smell. It's so refreshing! The only inconvenient is the place is getting very popular so it's quite difficult to find a quiet spot during the weekend. I would recommend to go very early or on a week day. So you can have the place for yourself. Best pound you will ever spend! It's a bit of a mission to get to, if you don't have a car. But this place is getting more and more popular year on year. As soon as you arrive you can smell the lavender in the air, it's so refreshing. The fields are beautiful, there's not Much to do except smell the lavender and take a billion pics for your insta feed, but it's definitely worth it! There is a cafe and shop selling lavender products, bit pricey. But smells nice! Top Tip Go on a weekday, weekends are packed and difficult to Take that selfie without anyone photobombing it! At £1 entry for each person this place seems a bargain. When we visited towards the end of August, the lavender was faded and not as vibrant as the various Instagram pictures that had originally hooked us. It wasn't as crowded as we feared for a Saturday and we were able to take pictures uninterrupted by people despite it only being 25 acres. The fully licensed cafe looked delightful though slightly on the punch side. Another drawback was that you weren't allowed to bring in your own food to enjoy in the fields. Overall it's a lovely space to spend a couple of hours, however, it's not worth making a day trip of it especially if you're travelling from afar. A perfect day trip if you fancy getting out of the city and being transported to a completely different (and magical!) place. You can smell the lavender before you see it and it's just lovely to wander through the fields and take in nature's marvel. Unfortunately they had already harvested most of the lavender but there was a section left and even just walking through that bit was wonderful. It does get a bit crowded so would recommend coming early or even during the week if at all possible. They also have a nice little café area where you can get things like lavender ice cream, lavender lemonade, and even lavender cider (!) The souvenir shop also has nice gifts to bring the fields home with you (but only if you fancy smelling lavender all day--this stuff is potent!) Also, if you take the bus number 166 to get there from Purley station or elsewhere Google Maps and Citymapper for some reason recommend to get off at a stop and then walk 11 minutes, but there's actually a stop right in front of the entrance to the fields so don't listen to the apps and check with the driver! I have always begged Mr.Moose to take me to Provence. I would love to walk among rows and rows of lavender, the smell and colour permeating everything. Well. That didn't happen but we did the next best (and certainly cheaper) option of going to Mayfield Lavender. We went on a Sunday-- which yes it was crowded, but we really did not have any problems finding some solitude as we ventured to one of the far corners past the cafe's and 'up an incline'. We also went pre-noon, which was also good as it started to cloud over and then rain as we left. We did drive there, but there is a train station 'close by' if you are willing to put the foot miles in. Highly recommended, and they seem to be dog (on a leash) and kid (leash optional) friendly. And they have two cafe's on site to keep your tummy happy. No picnics like IN the lavender, you need to sit on the benches provided. Also if you are deathly terrified of bees, maybe not come here. It's swarming with them for obvious reasons, but believe me, they have other things on their mind then you. Why bother going to Provence in Southern France to see Lavender Fields when you can go to South London instead? 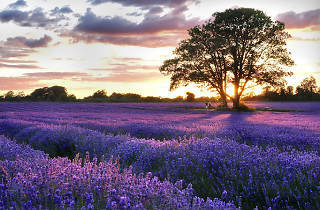 Mayfield Lavender is a 25-acre organic lavender field located in Surrey Downs, not too far from Croydon. It’s a hugely impressive site with lavender stretching as far as the eye could see. It’s at its most beautiful when the sun is out. As a visitor, you’re allowed to wander the field and take in the scent. It’s the most fragrant and therapeutic walk you’ll ever have and if that wandering has left you parched, there is an alfresco tea house close to the entrance where you can refuel and buy all things lavender. Unless you live in Croydon (you lucky sod people! ), it is quite a trek to get there and the bus ride feels like forever. But having been there, I highly recommend it and the trek is certainly worth it. It’s a wonderful place, but if you want to fully enjoy it, take a day of work and come on a week day as the crowds on weekends are unbearable (the owner told us there’s 60% less people during the week). If you don’t drive, getting there can be a pain. It took us 2h to get there from east London. We tried to walk there from the station, most of which was pleasant, but suddenly you end up on a road leading to the farm in a massive traffic jam and there’s no space to walk along. In the end we had to hitchhike for the last mile or so as there was no other way. To come back we relied on the only bus to Croydon, but it’s small, comes only every 30 minutes and there’s a big chance you won’t get on it. It’s a really adorable place for photos, but with this number of people it’s very hard to take the desired shot without having 30 other people around you. The queue to the café was horrendous and the prices are a bit inflated (£17 for an English breakfast?! ), so I advise taking your own packed lunch and make a nice picnic in the field (there’re plenty picnic spots) as there’s nothing else around you where you can eat at. The farm shop offer a lot of great goodies, from lavender chocolate, through bread to lovely bunches of freshly picked lavender. Totally worth visiting, but you need to plan it well. Over the last couple of years, Mayfield Lavender seems to have increased in popularity immensely (likely in part due to the number of lavender washed images on Instagram). If you are looking to visit, definitely plan your visit in advance as if you aren't driving, you have to use a small public bus to get there and it can get pretty crammed in on there. As well as the cafe (the cream-teas with lavender macaroons look lovely) and nursery shop on site, the lavender fields also have several features such as the red London phone-box and a little outdoor eating area covering in vines. Entry costs £1 (although I've visited later in the day before and it is sometimes free). The Mayfield Lavender Farm is an organic lavender farm open from June to September. It’s in Surrey, but also within the M25. I went in the first week of July and all of the lavender was in bloom. It was an extremely difficult place to get to by public transit - tube, train, bus - so I would definitely recommend calling ahead to make sure the lavender is in full bloom before you make the trek to the farm. Once there, it costs £1 to walk around the farm, through the lavender fields. It is really beautiful, but was smaller than I had imagined. They have an outdoor cafe and farm shop which both looked nice, but be warned the facilities are porta-loos. It took me over four hours round trip to get to the farm from central London, via public transport. If you’re doing the same, best to plan to make a day of it and maybe take a picnic. They have tables dotted throughout the farm where you can enjoy them. You'll be happy you made the slightly long trek to Mayfield Lavender Fields if you go some time between June and August. Bring a picnic, bring some water, (maybe some bubbly) and lay down in between the rows of flowers. The smell is incredible. You can tell you're getting close just from your nose. And if you need to add to your senses, I recommend getting their lavender scones, they're incredible. If you're feeling fancy get some lavender lemonade too! Maybe you'll even leave with a few treats. Lavender pillow? Yes please! Just make sure you bring a camera and some sun cream, even if its overcast, you'll need it! Is this even London? You'll probably be questioning. Located in somewhat the outskirts of London (roughly 1-1.5 hours away by public transport from central), the lavender field is simply beautiful. The lavender fragrance kicked in before we even got off the bus, and I have to admit that I got a little too excited! I always get a little crazy over photogenic places and this is no doubt one of them. With £1 entry, you get to immerse yourself in a purple paradise, with bees humming and the occasional wind brushing, this makes the perfect dreamy getaway. There's an on-site outdoor cafe, where you can enjoy a quick lunch with their lavender flavoured ice cream, lavender cookies and many other food products. Or simply just rehydrate yourself with a bottle of lavender lemonade or a cup of lavender slush and chill on the benches under the food tents. Next to the cafe is a shop selling all things lavender. I bought some lavender soap home and oh my, my bag smells so strongly of lavender at the end of the day! Go on a sunny day, the view is surreal. Do take note that the purple time of the year ends in late August, you wouldn't want to miss it! :) visit my blog for more tips and directions. The Mayfield Lavender fields are my latest hidden discovery within London. Located within the leafy suburbs of Banstead, South London you would hardly realise they were ever there. You immediately get the sense of being whisked away to Provence. Row upon row the brightly coloured purple lavender flowers against the backdrop of blue skies on a sunny day make it an absolutely charming place to visit. Embrace the fresh soothing lavender fragrance that hits you as soon as you arrive. Everyone is very friendly and welcoming. It's fairly accessible by public transport although it is easier to drive there as there is ample parking for the cost of a pound it's a small price to pay which is redeemable against purchases over five pounds. Their café and shop has lots of lavender themed goodies and they even hold an annual photography competition. In my search to find something different for a day out, I visited this lavender field, which was quite a trek for for me miles across the other side of London. It was all a slightly surreal occasion, as it seems to be well known to Japanese tourists, who made up most of the other people there, along with some goths doing a photo-shoot. So, pleasantly weird, it smelled gorgeous, I bought some nice soap (and slightly odd lavender fudge) from the gift shop, and it was a bit like a day out in the country, while still being able to use an Oyster card. What a superb idea...fantastic not only for the "health " of Croydon but a beautiful venture to bring colour and vibrancy to the twon and to encourage local wildlife and bees in particular to thrive once again....well done Mayfield Lavender!